So one of my freelancing gigs is managing various social media accounts for various companies (mostly dealing with home improvement). Today a follower of one of the Facebook accounts I maintain (My Home Rules - give it a "Like" and I get 25 cents! That's right. Living the dream people) sent me a message seeking promotion (or more likely money) for a Kickstarter project he's working on. This is a longshot...but I figured why not. First off, working a Facebook page as part of your job is awesome and sounds like fun, personally. Maybe I'd go for something different than home improvement, but you know, it could be a lot worse, like a gasket company or something. I mean, how much could one say about gaskets? Once you get past the "check your gaskets" and the "keep them well-oiled" bits...you're kinda done, you know? Anyway, I'm contacting you on a totally selfish, personal level. Susan, you're a wordly sort, no doubt. A human being who's seen much and learned even more. A persoon with a passion for knowledge and a yearning, nay, a great yearning for creative pursuits. And thus, I present to you a mighty thing. A great thing. A project of intense wonder and zeal. 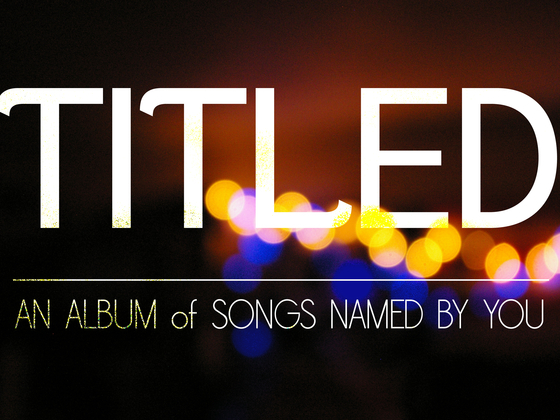 It's a Kickstarter project called Titled: An Album of Songs Named by You. The concept is simple, yet brilliant. Backers name the songs, the musicians write the songs. It's pretty darm amazing. Am I seeking money? You bet, man. Even a dollar would be useful. It gets you a thank you email, a haiku, and a spot in the liner notes. Oh yeah, you heard that, dude. Your name in the liner notes, of possibly the most unique album of 2013. It's the future, who can say? This album might simply be the most talked about work of art for the next decade, and by jimminy, your name could be a footnote on the seminal work of its time. I mean...it's unlikely, sure. But TOTALLY POSSIBLE! Susan, I simply ask for your attention to my Kickstarter. It smells faintly of lemons and is made with memory Floam to adapt to the shape of your mind. As the writer of many a long, rambling treatise, I appreciated Michael's long, rambling request and attempts to relate to my odd job writing about home improvement (for the record, if you can talk about gutter guards several times a day 365 days a year, there is plenty you can say about gaskets). I also love the concept of the the project itself, "An Album of Songs Named by You": Backers suggest a title for a song and Michael and his crew of musicians write and record the song. Song namers also get a mention in the liner notes. "It's unlikely sure. But TOTALLY POSSIBLE!" The cynical, exhausted mom in me sees the sad truth of the first sentence. And the wannabe novelist in me wants to write the second sentence backward on my forehead in Sharpie marker so that every time I look at my haggard face, drool-covered face in the mirror (Jovie has started gnawing on my chin - I fear she might be part zombie), I can be reminded that there's hope yet. You're right Captain Planet. The power is mine. 1. Susan Jennings: "a wordly sort, no doubt." 2. Susan Jennings: "A persoon with a passion." P.S. -- What's a gasket, and should I be checking mine?